BlackBerry rolled out a new beta version of BBM Channels, its upcoming social platform aimed at high-profile brands and celebrities, with a ton of new features today that should improve the general user experience on BlackBerry 10. Search is the most notable addition, as it introduces a new ‘Browse Channels’ tab to help users discover additional accounts to follow. It’s not a game-changer by any means, but will enable users to look up some of their favorite companies and start following them from the outset. 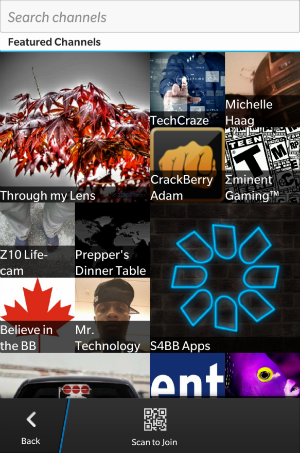 Individual BBM Channels are also being updated with clickable PINs. These essentially work in the same way as a handle does on Twitter – users can share them through Facebook or Twitter and if someone else taps on it, they’ll be taken to the appropriate channel in the BBM app. The ‘Browse Content’ tab has also been tweaked this time around so that content is only shown from channels that the user hasn’t already subscribed too. The area is presumably being targeted as a place for users to discover new content, so it makes sense to hide channels that are already visible elsewhere. Users can also delete their own channel at any time – a pretty crucial feature – and also repost other people’s content in their own channel, similar to Twitter or Facebook. Other small, but notable additions include a subscriber count, now available from the channel preview screen, as well support for those all-important animated GIFs. BBM Channels was unveiled by BlackBerry CEO Thorsten Heins in May as a new method for brands and companies to reach out and engage with BBM users. The idea feels very similar to Plus Friend Home, a combination of both instant messaging and passive social network accounts which was recently unveiled by Korean-startup Kakao for its cross-platform messaging app Kakao Talk. BBM Channels will be rolled out later this summer for the BBM app on BlackBerry 10. The company has also confirmed that it will be added to its upcoming Android and iOS apps sometime later this year, alongside other advanced features such as voice and video calling.